Bridgestone Potenza RE-11 tires are developed with the latest in high performance tire technology to give drivers impressive handling and control in both dry and wet weather conditions. With technology taken from Formula One tires, the RE-11 features a 3D seamless stealth technology. The large tread blocks on the outside of the tire give excellent cornering capabilities, while circumferential grooves remove more water from under the tire to guard against hydroplaning. 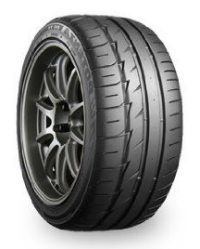 An asymmetric tread design that is unique in how it distributes its footprint give the tire more performance on the street or at the track. The Potenza RE-11 ranges in price from approximately $130 for a 15″ series to more than $300 for 19″ series. Who Is The Bridgestone Potenza RE-11 Designed For? Make no doubt about it, Bridgestone has designed the RE-11 tire for drivers looking for serious performance handling, grip and control on their sports cars, coupes and sedans. Bridgestone backs up the Potenza RE-11 with a 5-year materials and workmanship warranty. It provides free replacement first 3 years and then the remaining tread is prorated. As you would expect with this type of tire, there is no treadlife or road hazard warranty.